Cookbooks....boy have I got a boatload of them. They're my "reference books"-my "encyclopedias", if you will, that hold valuable information when it comes to cooking and baking. When I need a new idea-or want to reach back for a tried and true one-I can walk up to any of the bookcases loaded with these treasure tomes, pull a book off the shelf (or 2 or 10 books...) and find a boatload of inspiration. This recipe is and oldie but goodie. My Mom and I each picked up a copy of this cookbook at a church fair we went to years ago. She made the recipe, raved about it, and told me I needed to try it. When I saw gin listed as an ingredient in the recipe, I was surprised Mom had made them. Neither she nor my Dad drank gin-and Bob and I don't care for it. She said she was intrigued enough by the recipe to pick up a small bottle and give it a go. I like to use freshly grated ginger in the marinade, but have used ground ginger and it works just as well. I use a little less than a cup of sugar-the cup isn't level-and I always use the lower sodium soy sauce. One of the keys to the wonderful flavor of these wings is allowing them to marinate a good 24 hours-the wings in the photo marinated about a day and a half. Baking them in a single layer and flipping them over halfway through the baking time allows both sides to glaze up nicely. Am I ever glad my Mom made these and insisted that I give them a try. One taste and this recipe shot right to the top of my favorites list. I don't know what the gin does in this marinade-you can't taste it in the finished product-but it works some kind of magic. I guess it's that secret ingredient that makes people say "I don't know what's in these, but they taste FANTASTIC!" They're the perfect mix of soy, garlic and ginger with just the right amount of sweetness, and that slightly sticky glaze is finger-lickin' good. Since the wings are best served warm, I like to make them ahead and put them in a crock pot on low. If you're looking for a new idea to serve at your Super Bowl party, or if your family just loves chicken wings, I hope you'll give these a try. Whisk together the soy sauce, sugar, gin, garlic powder, ginger and honey in a small bowl until well mixed. Place the chicken wings in a heavy resealable plastic bag. 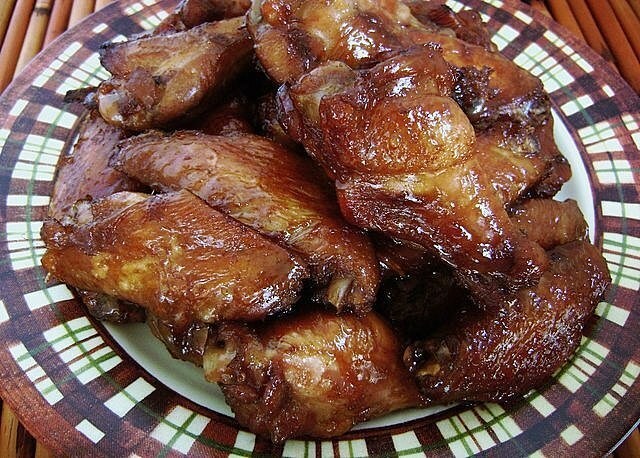 Pour the marinade over the wings, seal the bag and place it in the refrigerator for at least 24 hours to marinate. Line a large rimmed baking pan with foil, then spray the foil with nonstick cooking spray. Spread wings in a single layer on the prepared pan. Discard any remaining marinade. Bake @ 350 degrees for 25 minutes. Turn the wings and continue to bake @ 350 degrees for 20-25 minutes more or until the wings are golden brown and cooked through. Serve warm. I bet this tastes as good as it looks. The marinade sounds so good. I used to make a flank steak recipe that used gin in the marinade, and it was one of my husband's favorite meals. I like that you marinate the wings in a bag, saves so much time on clean up. I must save this one now. I know it will be a favorite. Thanks Carol, for your Thursday share. These sound so good! I think I have made something like this in the past but who knows where that recipe is! Thanks for sharing this...pinned! I have been wanting some Chicken Wings that were not overly hot. We had hot wings last night and they burned all the way down. I will try this one for sure. Thank you so much..
Hi Dottiemaye-these aren't hot at all. I had never had chicken wings that were hot before "Buffalo Wings" became popular....oriental wings were the only kind I had tasted. Like these....they're really good. Hope you enjoy them. I'll be making a batch for the big game this coming Sunday. These sound delicious, I always love the different Asian flavours. Your wings look fabulous! Thank you so much for sharing with us for our 5th Anniversary of Full Plate Thursday! Hope you have a fantastic week and hope to see you again real soon! Thank you Miz Helen-Happy Anniversary! Just pinned this recipe! Looks delicious!! Thank you Leanne-I made these for Super Bowl Sunday and have a few left for lunch today-I'm really looking forward to it. I was thinking these would be great for the super bowl!! They look yummy!! Thanks for sharing on My 2 Favorite Things on Thursday...Hope to see you again tomorrow!! Pinned! One can never have too many wing recipes. Thanks for sharing. These look yummy! I agree with you K. Elizabeth-wings are SO good and there's no such thing as too many different ways to fix them. I will be sharing this recipe on twitter and pinterest! Thank you for linking up with us this week for Brag About It! Thanks for the shares Laurie! They're so good Jess...a real treat when I make them. Wow these wings sound amazing! Thanks for linking them with the Tips & Tricks link party! Thanks Heather-I hope you enjoy them if you decide to give them a try. This Asian style chicken wings are really yumm, love this one, thanks for sharing with Hearth and soul blog hop, pinning and tweeting. I'm happy to inform you that this recipe is being featured at our Monday Cooking and Crafting with J & J. Yum!! I love having a variety of wing recipes!!! I love having a big wing recipe collection too....they're so good and different versions are so much fun to try.